Stress. Everyone has it at some point and many people experience it to such extremes health and wellbeing can be severely compromised. There is the day-to-day stress that is part of managing your life, relationships, and career and then there is bigger stress that comes from all the scary things happening in the world. Stressful events and situations are not going away. But, we can look to natural ways to relive stress and preserve your wellbeing. Triggers are all the things, people, places, experiences that tee off a stress response in your brain and body. Before you begin diving into some of the natural ways to relieve stress I’m going to provide for you, it’s important to first know what it is that sends your stress levels soaring. Be the observer as you move through your days and be keenly aware of where you are, who you’re with, what is happening just before you notice feeling stress. Begin accumulating data! Make note of what your stress triggers are in a journal or an index card you keep with you. Once you have identified your triggers it will be a lot easier to make conscious choices about your schedule, events and to create systems of managing your stress. Here are nine natural ways to relieve stress. I began my own personal meditation practice in 1993 when I was 26 years old. I’ve been meditating as a regular practice ever since and I’ve taught meditation to others for over 20 years so I know for a fact this is a powerful agent for stress relief. Back when I started this practice, meditation was not at all a mainstream practice. Now, meditation has become something medical doctors are prescribing because Science has proven with brain scan studies how effective meditation is at helping people to manage stress, regulate emotions and strengthen executive functioning skills. 15 to 30 minutes a day of some silent time daily can be a huge help in relieving stress. Find a quiet room, get yourself comfortable and focus on your breathing. That will allow your mind to shift away from your worries and help you to practice coming into present moment, here and now while your brain, breath and body can come into alignment. Some Americans have chosen to start a practice called Qigong, which is a holistic system of body coordination and meditation that’s great for chakra balancing amongst other things. With roots in Chinese medicine, it is used for health, relaxation, self-healing and martial arts training. It typically involves a calm meditative state of mind with deep rhythmic breathing and slow, flowing movements. It does not matter what type of exercise you do as long as you get your body moving. You will experience a release of endorphins which will improve your mood and make you feel more alert. It sounds so obvious and yet we still are very much a sedentary society. It’s common for people to start an exercise program and then give up after a couple of weeks. Everyone tends to think they have to go jogging or visit s gym every day but that need not be the case. The key is to find an exercise that you enjoy. Dancing or swimming, for example, are fun ways to get your exercise. The aim is to get your body moving, your heart rate up and your lungs activated for optimum mental and physical health. It has been proven that junk and processed foods can contribute to stress and depression, so avoid them like the plague. Eat plenty of fresh vegetables, fruits and lean protein sources. According to scientists, certain foods in particular like blueberries, almonds and salmon can help relieve stress. Many Americans eat processed foods for convenience, but it is much better to skip the drive-through and packaged foods. Preparing a meal of whole healthy foods only takes a few extra minutes and the health benefits can be enormous. As well as stress-related problems, junk and processed foods have been linked to diabetes, heart diseases, and some cancers. They can also cause muscle and joint pains. Leaving them out of your diet, or at the very least greatly reducing the amount of them you eat, will be good for both your body and your mind. Constantly being on your phone or other digital device does not help your stress levels. Take substantial breaks from the screens every day. Power the device down and put it in a drawer. Otherwise, that compulsive tendency we all have will find you picking it up to check posts on social media and emails. While social media and email can be positive means of connecting, sharing and gaining information for personal and professional reasons, too much time on digital devices contributes to our overall stress levels. Sleep deprivation is a real problem in our society. Stress makes it hard to fall asleep or it can wake you up in the middle of the night not allowing you to go back to sleep. It’s a vicious cycle because sleep deprival then contributes to stress levels. The most natural stress reliever of all is quality sleep on a regular basis. A lack of it will wreak havoc with your mental and physical health. If you have trouble getting to sleep, there are a few things you can do to help. Turn off digital devices and TV’s an hour before you go to bed and a warm bath or shower just before you retire for the night can also help. Turn down the thermostat to keep it cool. Avoid eating a large meal for 2 or 3 hours before bedtime. There are certain aromas that can stimulate the production of chemicals that affect the brain and help to produce feelings of calmness, relaxation, and love. For some people this is the perfect answer as they find the likes of lavender, cypress and rosemary reduce stress levels and mental fatigue. Essential oils, such as these mentioned, can be difused or applied in a bit of coconut oil to your pulse points. Having a well organized life is a lot less stressful than running around not knowing what you are going to do next. Plan your days in advance, create effective systems for ensuring you know what you need to accomplish and stick to your plan. There will always be unexpected events that throw your plans off course, but at least you will know what is missing from your plan for that day, rather than be stressing out over what things you have not done. Clear the clutter in your home. Research has shown that when people have a tidy home with cleaner, clearer surfaces and a place for everything, people tend to feel happier and less stressed. For your business or professional needs, you might consider hiring an organizational consultant such as Liz Gray of Organize Your Private Practice who helps therapists in private practice create organizational systems to achieve greater order and more peace of mind. A lot of people rely on alcohol to induce relaxation but I’ve got some news for you. While it may help you feel relaxed at first, when that initial effect wears off you’re more likely to wake up feeling anxious in the middle of the night. Consider skipping the cocktails. Instead sip on a cup of chamomile or kava tea and soothe your mind and body. Try to intentionally slow everything down in your day. Catch yourself when you start gearing up habitually. Choose to slow your breathing. Walk slowly. Eat slowly. Slow down your thoughts by consciously breathing deeply and returning to present time, present space. You’ll be amazed at how this will help you to mitigate your stress levels. It shifts your perspective. It provides you with a renewal in outlook and helps your mind and body to work together to be more present here and now. Your breath is always with you. Of all the natural ways to relieve stress, conscious breathing is the most immediately effective means to getting relief. One particular breathing technique that will provide a guaranteed relaxation response is one I call the “drinking straw breathing technique.” Grab a drinking straw (one that is straight and with a wider opening). Point the straw toward the ground. Take a deep, full breath in through your nose filling your lungs. Exhale by gently blowing through the straw until your lungs are emptied. Repeat 3 times. Return to a natural breath. 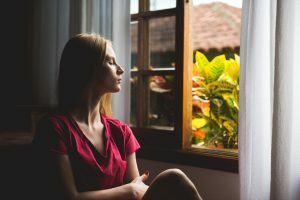 This technique forces your exhales to be much longer than your inhales and science has shown this elicits an automatic soothing of the nervous system. Once you practice with a drinking straw, you can do this technique anywhere – no straw needed. Stress happens. Accepting that stress is a part of life and having natural ways to relieve stress is key to managing the effects of stress on your mind, mood, health and wellbeing. Wow! I have to say that, although I’m certainly not perfect, I do every single one of these things. That makes me happy!